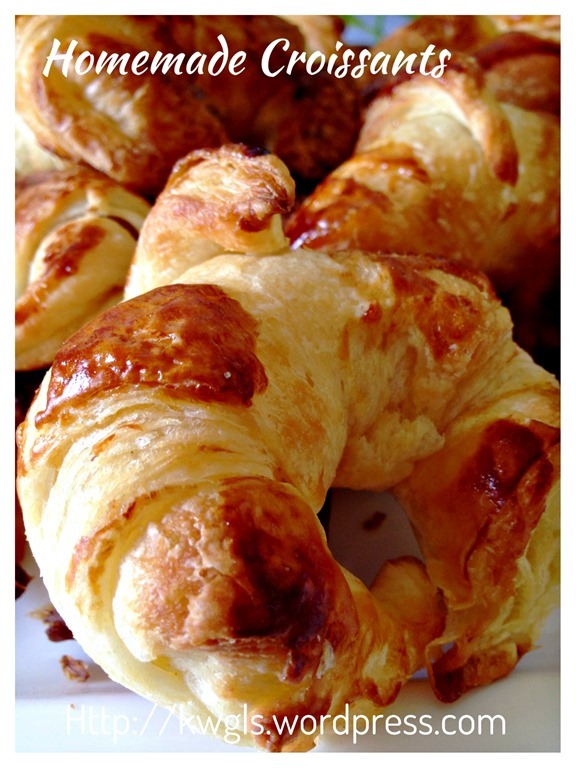 Though the above definition of croissant called for the use of butter in laminating the dough, it is definitely not an easy task in hot weather like Singapore and Malaysia. Butter melts very fast unless you are preparing it in an air-condition room.. 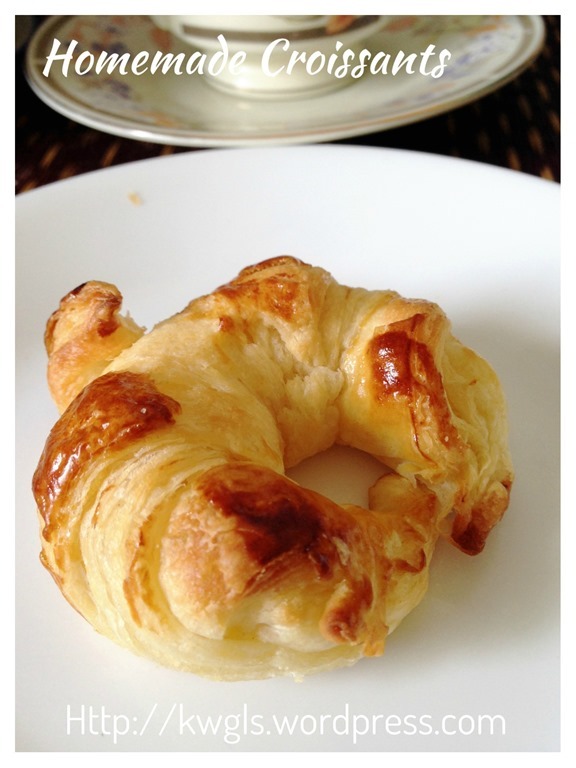 Therefore, for purposes of this illustration, I have opted to use pastry margarine purchased from bakery supplies shop. These are vegetable shortening usually used for the preparation of puff pastry including croissant. The margarine will not melt in normal room temperature and hence make you preparation much easier.. Some readers may be concerned about the use of margarine or vegetable shortening in the preparation. 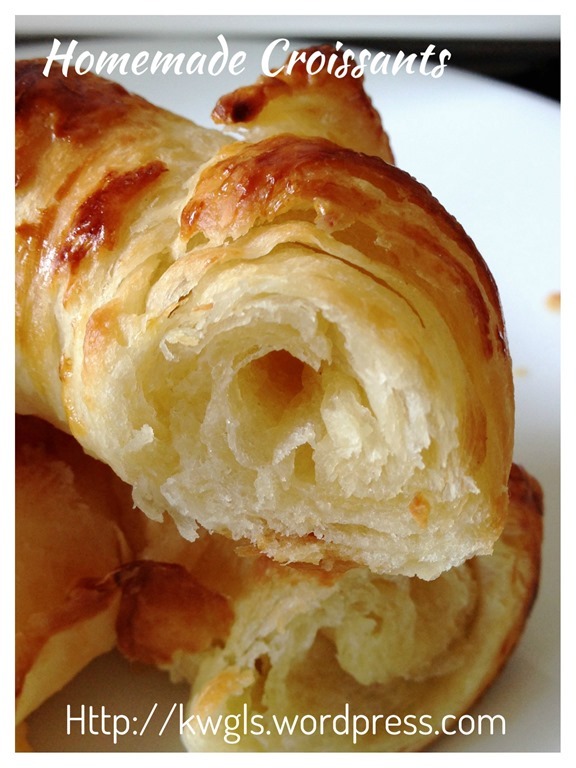 But is it not most ready puff pastry are prepared from pastry margarine? The choice will be up to readers to decide, you can either use butter or pastry margarine but just keep in mind that butter may result in a messy attempt and you will need to chill it for every laminating you did. 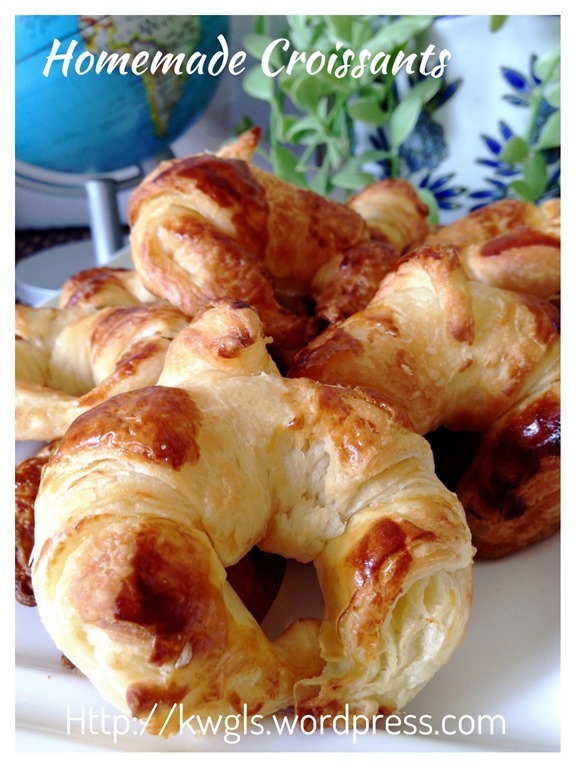 I have prepared these croissants from the frozen BASIC BREAD DOUGH RECIPE. 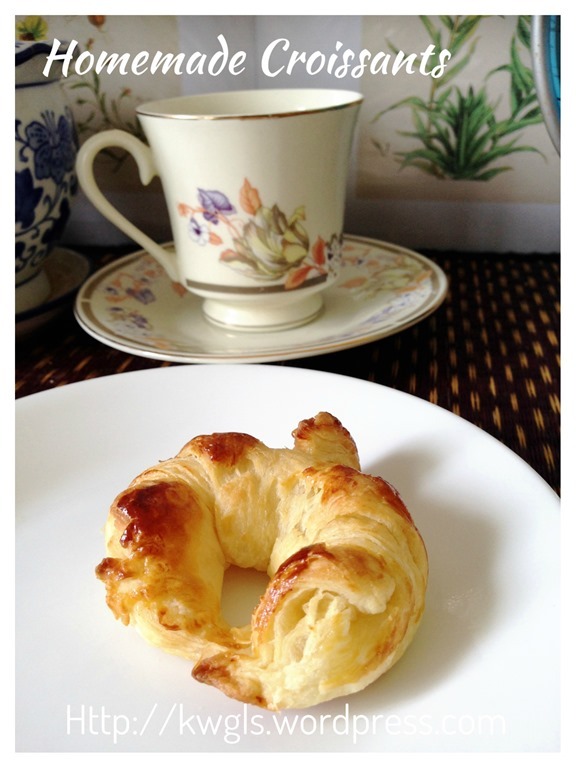 It is a flexible dough that can be used for many type of buns including croissant. 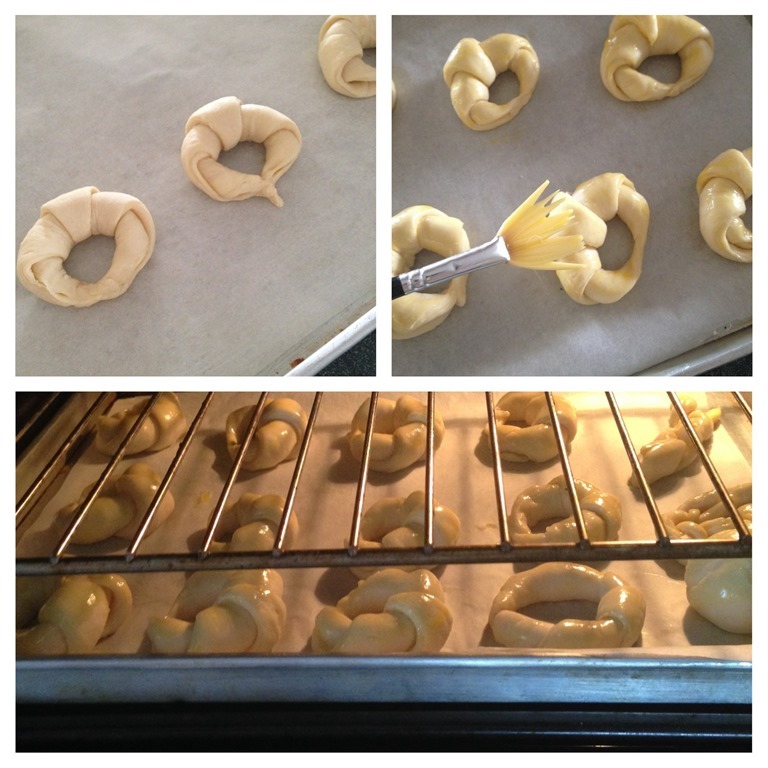 Besides croissants, I have also used it to prepared some chicken floss puffs. Either use the freshly prepared bread dough by following the recipe HERE or the frozen bread dough. Cut 300 grams of frozen bread dough in small chunks to facilitate defrosting. 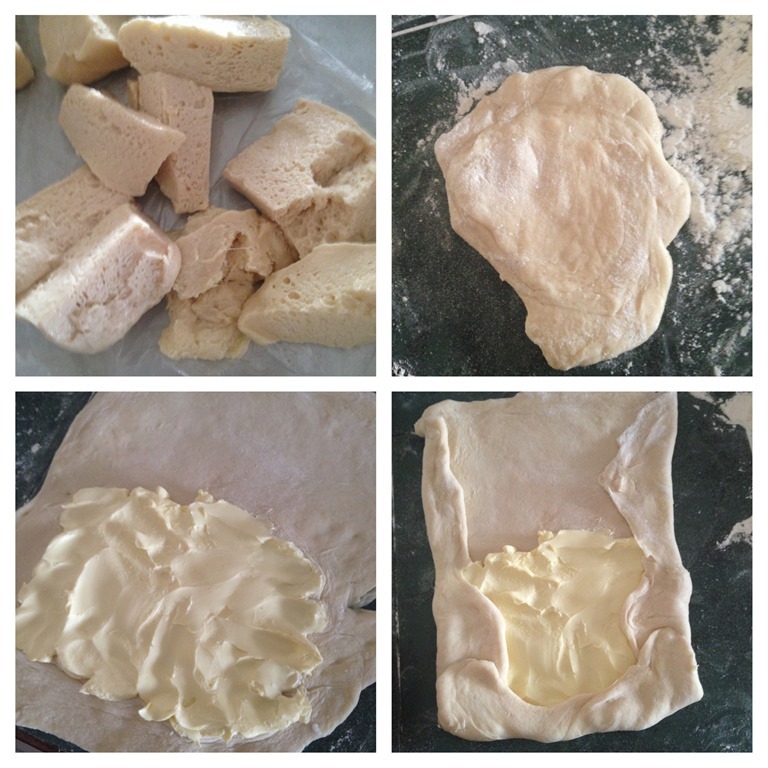 Once it is soft to touch, on a lightly floured work surface, gather the dough together and use a roller pin to roll the dough in a rectangular shape . 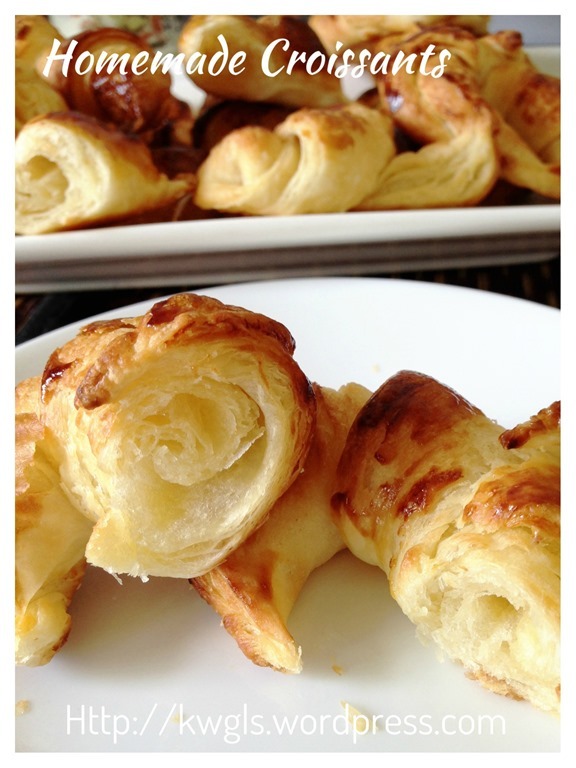 Spread the butter or pastry margarine on half of the rolled dough. Cover the other half on top of the half where the margarine were spread. Seal the edges and roll it as thin as possible. 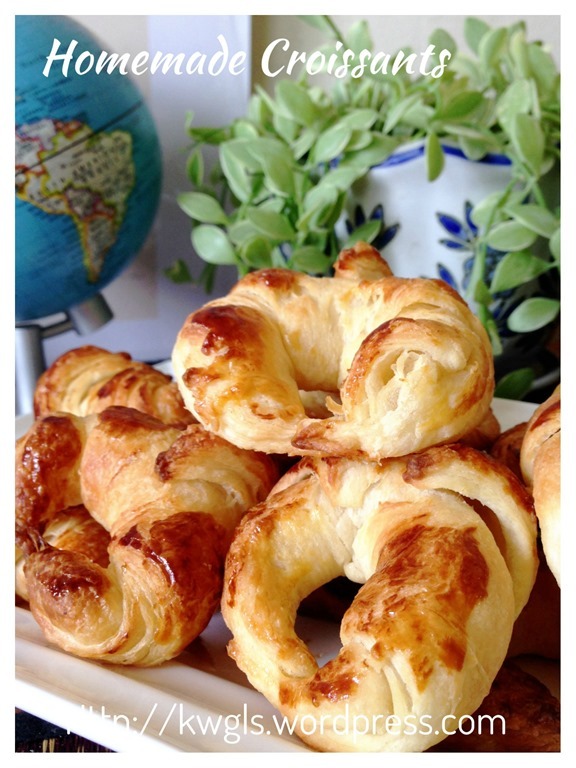 Fold the dough into 1/3 of the size overlapping each other. 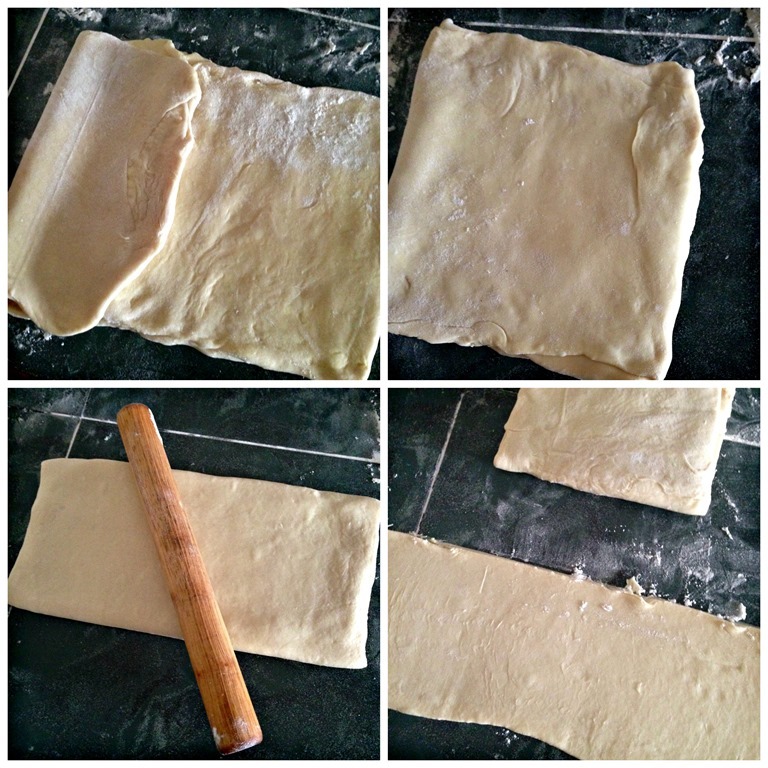 Roll thin using a rolling pin. Repeat the same procedure 3 times. 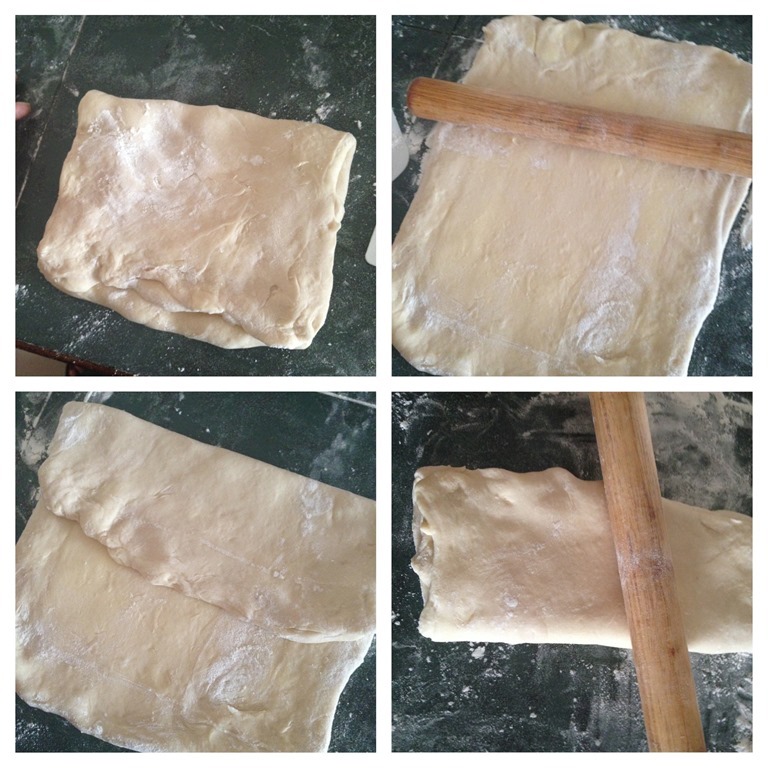 For the last time, roll the dough into about 64 cm x 45 cm. Cut the dough into triangle with base 9 cm wide and height of 19 cm. Use a knife to slightly cut a small opening of 2 cm at centre of the base. 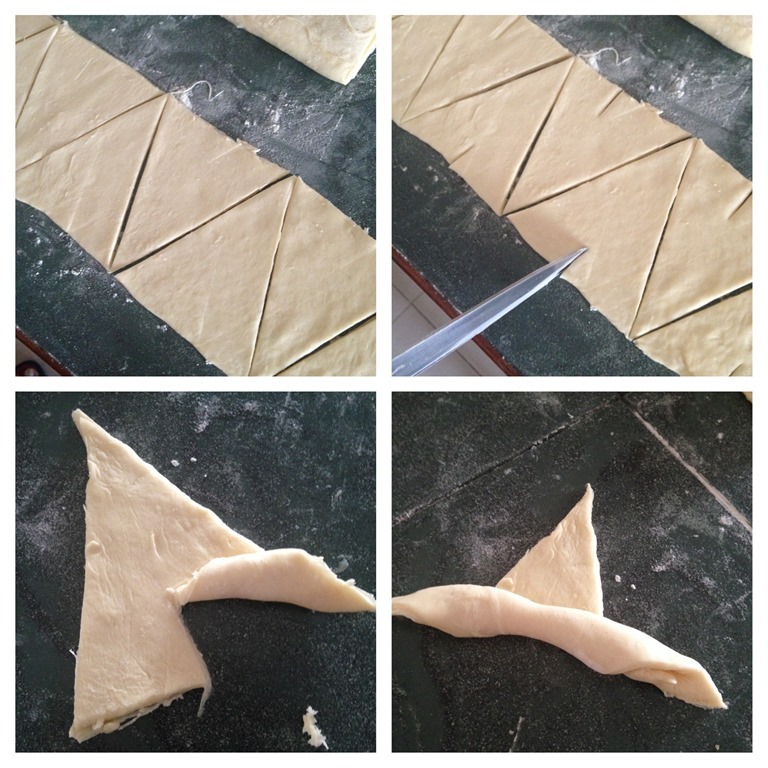 Use both hand, take the inner side of the cut opening, roll the dough outwards and towards the top part of the triangle. Seal both pointed ends and let it proof until double in size. Pre-heat the oven to 200 degree Celsius. Once the size is doubled, egg wash the croissants (one egg yolk with one tablespoon of water) and bake in the pre-heated oven of 200 degree Celsius for 11-12 minutes . 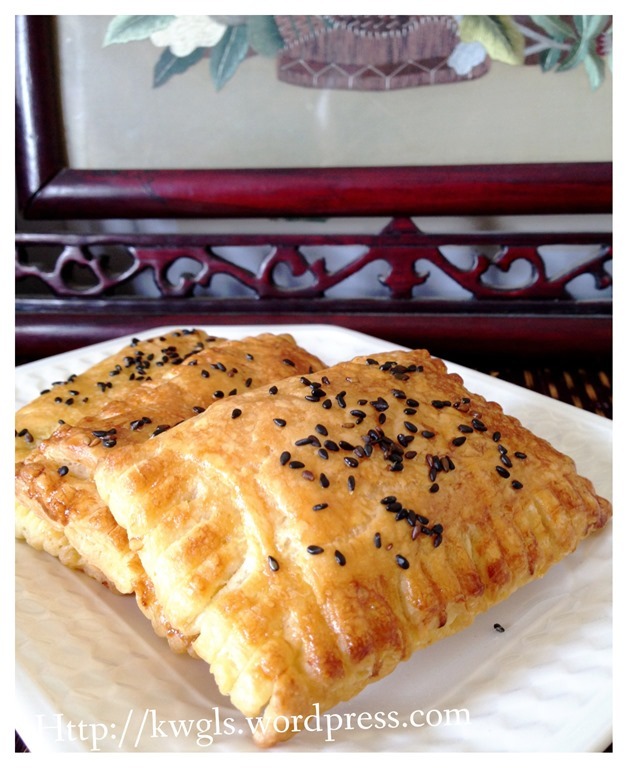 To make chicken floss puffs, cut the dough into 8 cm x 16 cm rectangular shape. Put some chicken floss or other desired fillings on one side dough. 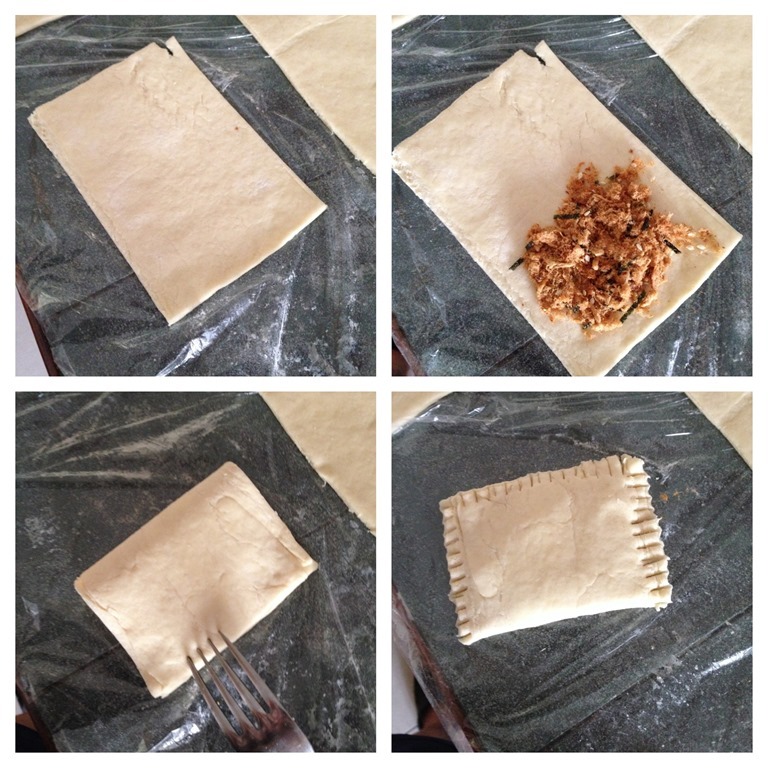 Fold the other side of the dough and use a fork to seal the sides. Egg wash as per above, sprinkle with black sesame seeds and bake at the pre-heated oven of 200 degree Celsius for 10-12 minutes or until the desired colour tone. I sincerely hope that my explanation is clear enough. 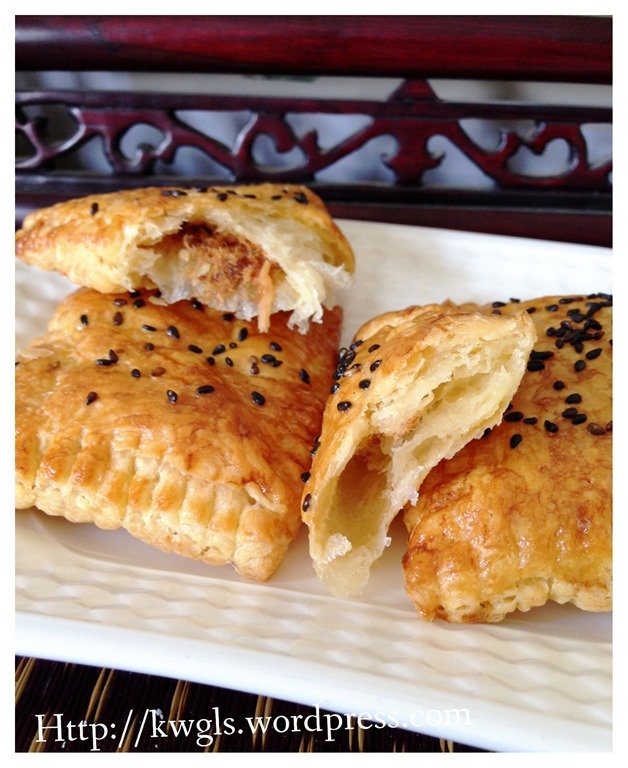 This recipe started from the frozen dough, however, you can always use fresh dough too. 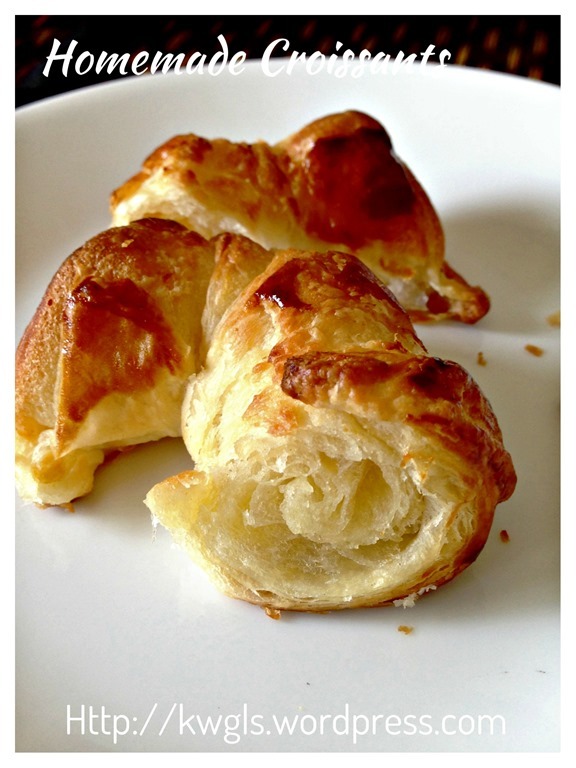 If you are concerned the use of pastry margarine, you can always used butter but mind you, it will be a tedious attempt as the butter can melt very fast. 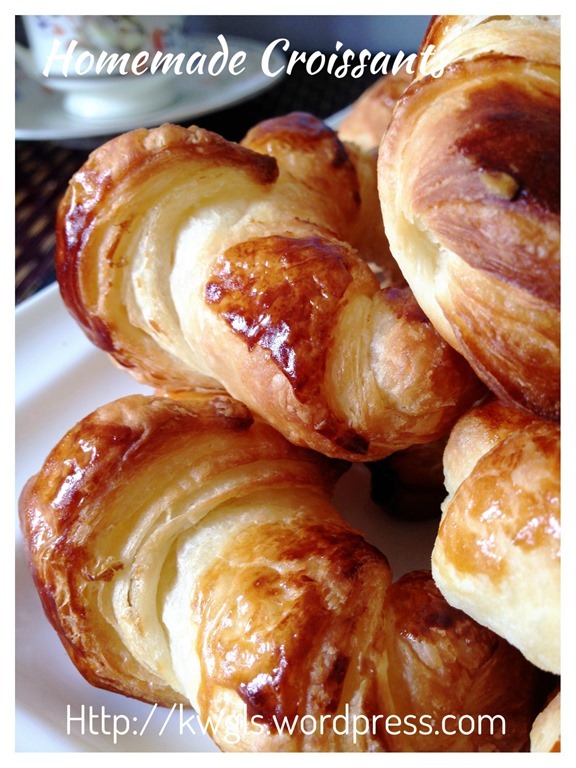 If you opt to use ready made pastry, check the ingredients and see if it is made with butter or pastry margarine. 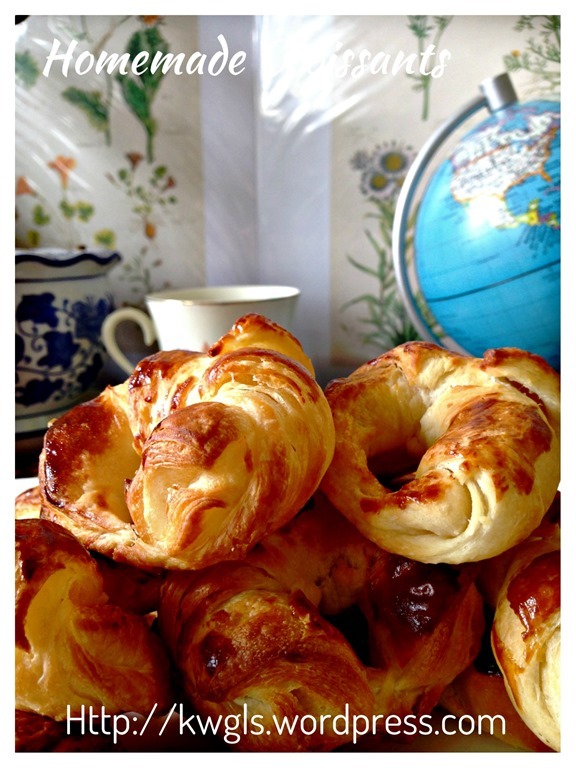 If it is made with pastry margarine, why not prepare at home at a fraction of cost? 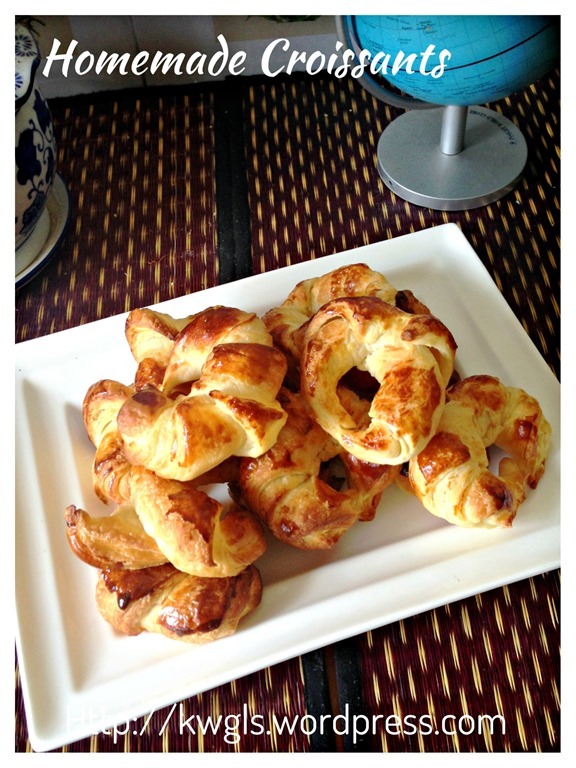 This entry was posted in Breads and Pizza, Food Preparation Series and tagged 8, 牛角包, GUAI SHU SHU, Guaishushu, Home Made Croissants, kenneth goh, postaday. Bookmark the permalink. 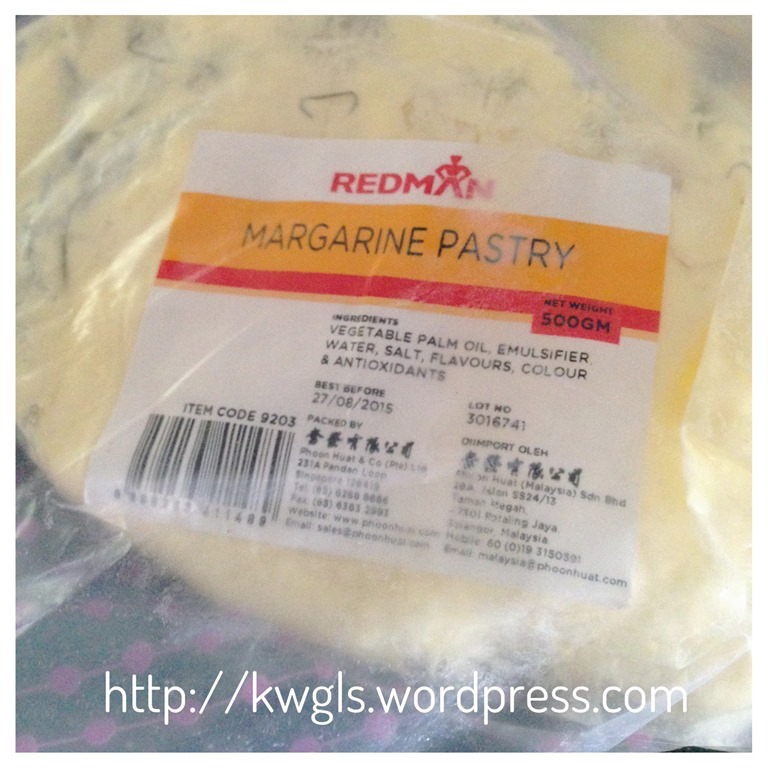 Master Ken, is pastry margarine same as vegetable shortening such as Crisco? Thanks. Same category but different colour and most importantly, different taste.